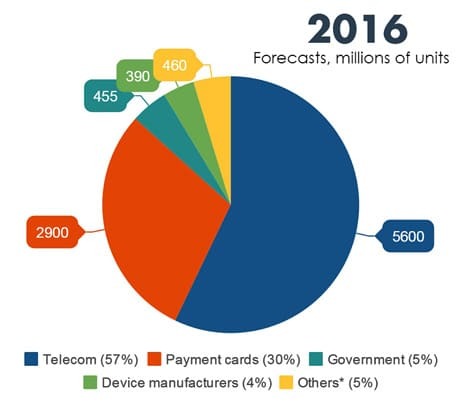 A total of 490m NFC secure elements will be shipped in 2015, up 40% on the 350m shipped in 2014, smart security industry association Eurosmart reports. A total of 590m units is expected to ship in 2016, up 20% on 2015. Eurosmart includes NFC-enabled SIM cards, embedded secure elements and “other form factors” in its definition of an NFC secure element. Overall, 9.2bn secure elements are expected to ship in 2015, rising to 9.8bn in 2016, Eurosmart says. 5.45bn of the total shipped this year were for use in SIM cards, 2.6bn for payment cards, 410m for government applications, 310m to device manufacturers and 430m for other markets including transport, PayTV and physical and logical access cards. 1.6bn contactless secure elements will be shipped in 2015, up 21% on 2014, the association adds. Of these, 1.1bn will go to the payment card market, 250m for government and 280m for “others”. In 2016, that number will rise 12.4% to 1.8bn, including 1.2bn for payment cards, 270m for government and 310m for “others”. India’s Oxigen Wallet to add virtual prepaid cards?